On a sweltering afternoon in 1966, Charles Whitman ascended the University of Texas Tower with enough firepower to hold off an army. For the next ninety-six minutes he methodically gunned down forty-five strangers, killing fourteen. But as shocking as the rampage that made world headlines -- and the murders of his wife and mother the night before -- was the smiling photograph on the front page: a handsome, all-American Eagle Scout and U.S. Marine. A bewildered nation asked: How could this golden boy be a mass murderer? At last we have an answer. Sifting through the facts and firsthand research, Gary Lavergne exposes the darkness behind Whitman's "golden boy" facade, and the issues this case forced America to confront: the insanity defense, domestic violence, military indoctrination, gun control. In his minute-by-minute account of one shattering day and its aftermath, Lavergne sheds new light on the mass murderers who have followed in Whitman's bloody footsteps, and the nation changed forever by their presence. An emotional and exclusive interview with Claire Wilson James and Gary Lavergne about finding the youngest of the Sniper victims: Baby Boy Wilson. Click here or on the image to watch this heartwarming interview. 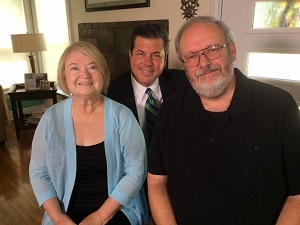 Click here to watch Claire Wilson James and Gary Lavergne tell her story of love and courage. Click here to watch a CBS Austin exclusive. Gary Lavergne walks viewers through the Tower and it's observation deck as he tells the story of the UT Tragedy of 1966.
by Michael Barnes, Reporter"Twenty years ago, as the 30th anniversary of the University of Texas Tower shootings loomed, Gary Lavergne completed an exacting account of the events that took place before, during and after Aug. 1, 1966. 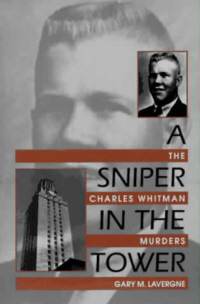 Sniper in the Tower: The Charles Whitman Murders, published by the University of North Texas Press in 1997, has since appeared in paperback, mass market paperback and Kindle editions. We sat down with the unassuming Lavergne--by day, the UT head of admissions research, and the author of three other successful books--in his office on the ground floor of the Tower. . . Click here or on the image to read this powerful interview. by Michael S. Rosenwald, Reporter: "I just laid down by the grave: A mother mourns the UT Tower shooting's tiniest victim. . . Click here or on the image to read this great article. by Tom Dart, Reporter: Monday marks 50 years since the first US mass shooting of the modern era. It also brings a controversial gun law to campuses across the Lone Star State. . . Click here or on the image to read this unique British perspective. by Rick Jervis, Reporter: 50 years ago, Texas campus murders ushered in new reality of mass shootings. . . Click here or on the image to read this great article. by Stephanie Manisero, Anchor and Reporter: The Author of A Sniper in the Tower Speaks on His Book's Relevancy. . . Click here or on the image to watch this interview from Gary's ofice at UT. by Lauren Silverman, Producer: Gun Violence And Mental Health, 50 Years After UT Tower Sniper Attack. . . Click here or on the image to listen to this fascinating interview. by The Texas Standard and the University of Texas Briscoe Center for American History: Gary Lavergne was a 10-year-old kid in August of 1966. He saw the UT Tower shooting on TV from his home in Louisiana. Lavergnes father was a police officer and he remembers his dads reaction to the Tower shooting. . . Click here or on the image to listen to this extended 49-minute interview. 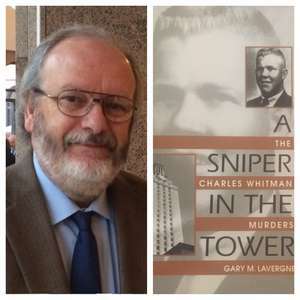 "Reading the authoritative account of the Whitman case, A Sniper in the Tower by Gary M. Lavergne -- which was published in 1997, before our recent mass murders -- one feels it's as much prophecy as history." 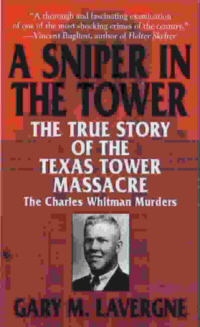 A Sniper in the Tower was first published in hardcover and trade paperback in April of 1997 by the University of North Texas Press. The limited hardcover edition sold out in ten days. Today, it is a collectors' item. The only edition currently available is the UNT Press trade paperback edition. Copies can be purchased through Amazon.com or BN.com (Barnes and Noble). Any bookstore can order the trade paperback edition. Just ask for ISBN #1-57441-029-6. Customers can also purchase a copy directly from Texas A&M University Press by calling 1-800-826-8911. In November of 1999, Bantam, Doubleday and Dell Books released the mass market edition of A Sniper in the Tower. SNIPER has the distinction of being a book, originally published in hardcover as a criminal justice/sociology title by an academic press, and reissued as a mass market true crime book. Mike Cox of the Austin American-Statesman wrote that Gary Lavergne created a "new genre"--true crime with footnotes. It may still be available online or some bookstores, but the edition is sold out and out of print. 1997 Violet Crown Special Citation for non-fiction. Best book by a local author. Top Ten Small Presses Book for 1997. Top Ten Books of 1997! Texas Standard: Gary Lavergne was a 10-year-old kid. . .